As a native Floridian with a Business degree from Florida State University, I never considered stretching my creative talents until later in life. My post-college choices, however, did much to educate me in the “art of living”. Serving as a combat commander in the US Marines (Vietnam 1968-69) and thereafter being released from active/inactive duty as a Captain, I then opted for some post-war “cleansing” and pursued global travel…South America, Europe, the Mideast (where, in Tel-Aviv, Israel, I lied my way into a chef’s position at a French/Italian seafood restaurant…menus in Fr/Ital/Hebrew) and Asia. After many thousands of miles logged on sailboats (in the Bahamas, the Caribbean and a trans-Atlantic crossing with a friend on a 30′ sloop), I sought a change of scenery in order to address an intensifying desire to paint…..in the mid-1970’s I packed my seabag and moved to Taos, New Mexico. After several years of thought, toil, and experimentation, the black and white (acrylic) images began to “come together” on canvas. 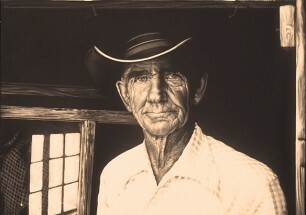 Although quite diverse in my choice of subject matter, I was known mostly in the Southwest US for my photorealistic paintings of the human face. 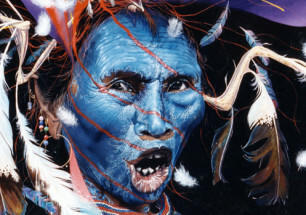 In my 10 plus years in Taos, I developed a significant chronicle of portraits of the “viejos”…..the “old ones”. 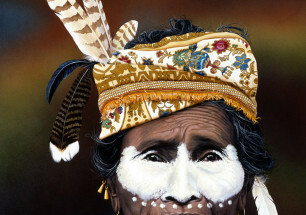 These good people, the old cowpoke, the Pueblo Indian, the local Hispanic icon, the wily backwoodsman, were nonetheless just ordinary people; but when rendered with such unflinching realism, their personalities, their life’s experiences seemed stamped on each face as if time had stopped for an instant, frozen. 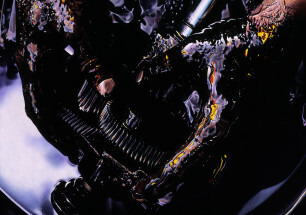 Their personal histories became subtly transparent and prompted a dialogue with the viewer, an uncharacteristic trait known to classic photorealism. When I moved my family to Albuquerque I was very protective of my “style” of painting (dry brushing white onto black); but as I tried to “grow” in to other areas I realized that I was wasting a lot of time figuring things out on my own. So after taking a few art classes to fill in the technical voids I moved on to color, and then to oil paint. As I did this and as I allowed myself to embrace the fluidity that came from blending oil colors, my subject matter changed as did the size of the canvas. 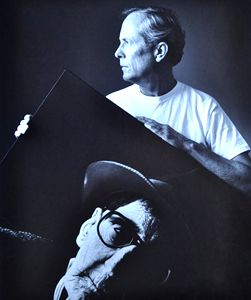 The canvas size in the black and white and the color “portrait” era ranged from 32″ x 40″ up to 40″ x 50″. 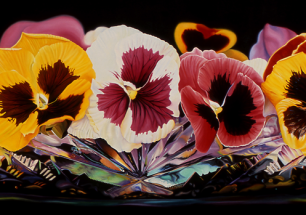 As I transitioned to oil paint, enlarged florals and reflective (glass) surfaces proved to be an exciting springboard for transformation…..and the size of the work went through a revolution as well….from 72″ x 76″ up to the largest work at 5ft x 10ft.Along with that revolution in style and size, came an evolution in my creative direction. On the 23rd of November of 2011…..after 42 years of sorting through the personal memories, as well as reflecting on the impact that a polarized America in the Sixties had on the outcome of the Vietnam War, I took the road less traveled once again and began a major mixed media piece that would become a narrative on canvas that provided a general sense of the mood and the realities of the Vietnam War era, as well as take a look at the attitude and events that typified the happenings back in “the world”. As I began my research it soon became apparent that this was going to be a complex undertaking and was going to be a lot more than a guy in a foxhole kind of painting. It is dedicated, specifically, to all combat Marines of that era, but also memorializes the veterans of all services, and their families, who sacrificed so much in the service of a country that was not all together in support of their mission. “Vietnam Elegy” was completed on 20 February 2014….Please visit vietnamelegy.com for an in-depth look at the project, the process, and its future. 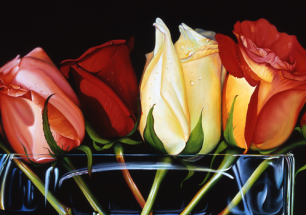 Some of Denham’s pieces are also available as museum quality digital reproductions (gicleés).